Last Thursday I tasted a few of the Smith's Farmstead Cheeses at the Brookline Farmers' Market. Their Extra Sharp Cheddar won a spot in our weekly cheese selection and I'm happy to report that when that cheese comes to room temperature it's just fabulous. We love good cheddars and think they are often overlooked because there are so many terrible, mass-produced food products that use that name. A good cheddar is a crumbly, creamy, melting, thing of beauty and this one fits the bill. 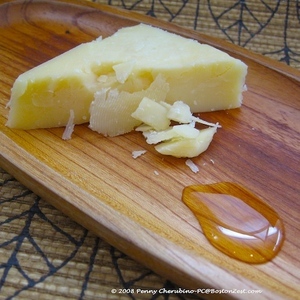 I did put a dab of local honey on the board but after a few bites, we both ate the cheese neat-- no honey -- no bread-- just nibbles of cheese with a nice glass of wine. From this eating team, that is a sign of a great cheese. I may have to take another trip to Brookline for more samples of the cheese produced by the Smith family. The extra sharp is aged for 18 months. I now want to try their 4-year-old Rat Cheddar. This may even call for a roadtrip to check out the source and learn more about this cheesemaker. There is a full list of retail locations on their website including the Brookline, Arlington and Waltham Farmers' Markets.